Houston's hospitals were well-prepared for Hurricane Harvey. In the past 10 years, hospitals in disaster-prone areas across the country have implemented both structural and operational safeguards to keep patients and staffers safe and prevent major damage. There were many lessons learned after Hurricane Katrina swept through New Orleans and the subsequent flooding after the levees failed in 2005. 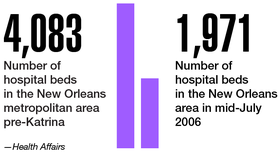 It took years for the city to rebuild its healthcare community. Download the PDF.